Artist’s concept of the Big Falcon Spaceship (BFS) docked with the International Space Station. Image credit: SpaceX. A lot of space advocates (myself included!) are looking forward to the first test flights of the SpaceX Dragon 2 and Boeing Starliner, the linchpins of NASAs Commercial Crew program. NASA is eagerly anticipating the first flight of the Orion capsule launched on the Space Launch System (SLS). Viewed from a more distant perspective, however, an observer might claim all three vehicles will be obsolete the day they first fly. A capsule with a heat shield that relies first on aerodynamic braking and then on parachutes to land either on land or water. A service module that contains many of the expensive components required to actually fly in space. SpaceX and Boeing intend to re-use their capsules, but the value found in the service module is expended with each flight. This observation applies equally to the Orion capsule. Attempts to put more value into the capsule for possible re-use have been led by Orion, which comes perilously close to the maximum weight that can be landed on Earth via the currently in-use parachutes. Although Orion is probably not the largest possible capsule that can be landed aerodynamically/with parachutes, the capsule/service module architecture fundamentally limits re-usability of many of the most valuable parts of the spacecraft, including the solar panels and engines usually found in the service module. To move to a larger crewed vehicle, a powered landing rather than a parachute landing is a necessity. With this change, combining the second stage with the service module/crew capsule becomes an attractive architecture. 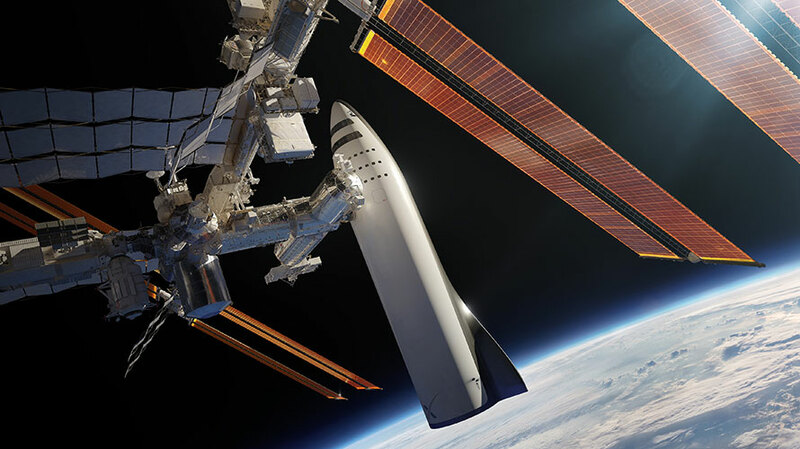 The proposed SpaceX Big Falcon Rocket/Big Falcon Spaceship (BFR/BFS) uses this radically new architecture for human spaceflight. The BFR is essentially an upgraded and enlarged Falcon 9 first stage, but the BFS is an entirely new beast. Combining the second stage, the service module and the crew capsule eliminates the need for a fairing and allows for full re-use of all parts of the rocket with the possible exception of the heat shield itself. The usage of powered descent to lower heating holds out the hope that the heat shield will need to do much less work than on a purely aerodynamic re-entry, thus allowing for higher levels of heat shield re-use. Perhaps the biggest issue the designers of the BFS face is the necessary improvement in BFS reliability to allow the crew to be coupled with the engines and fuel with no escape system. Of course, for Earthly modes of transportation this approach is routine. Some hold that rockets are magical, fiery beasts that will never achieve aircraft or automobile levels of reliability but in the end it either can be done or can’t be done. SpaceX and Blue Origin have certainly advanced the state of the art in rocket engine reliability already, so it may be unwise to bet against them. We also need to recall that the Shuttle combined crew, engines, fuel, and no escape system, so from this perspective BFS is what the Shuttle might have evolved toward. Although Blue Origin’s plans for the New Glenn crew capsule have not been announced, in order to compete on price with the BFR/BFS, a similar fully re-usable combined second stage/crew capsule seems a necessity. With the three-stage nature of the New Glenn, one possibility is that the third crewed stage will be fully re-usable in-space, a variant but possibly viable architecture. From a vantage point far in the future, the BFS may be viewed as the DC-3 of space, the vehicle that for the first time allowed humans to fly to orbit and back at a reasonable cost. Time will tell, but the race toward the future is more exciting than ever. Well said, Dale. You’re blog actually smacks of common sense! I would say Crew Dragon is the DC3 and BFS is the Boeing707.